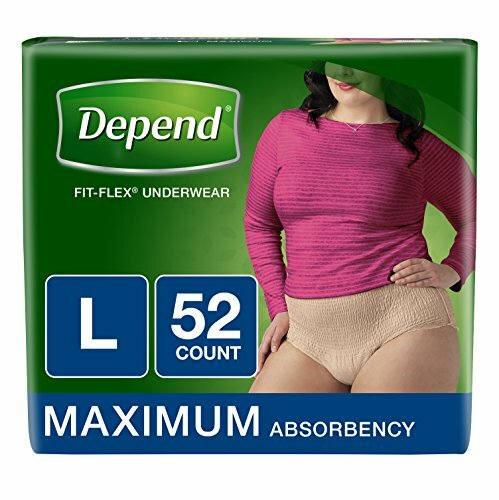 Reclaim and reconnect with what matters most in your life in the new and improved Depend FIT-FLEX Incontinence Underwear for Women. Now in more sizes for better comfort, Depend disposable underwear feature Confidence Core Technology – our fastest absorbing material – to instantly absorb wetness for dry, comfortable protection. Drawing wetness away from the skin, the thin, contoured pad locks in urine and odors. The slip-on style of this incontinence pant has all-around leg elastics for a close-to-body fit that's unlike bulky adult diapers. And with the improved waistband for added security for an underwear-like fit, Depend FIT-FLEX are designed to fit the shape of a woman and are more flexible† to move with you. Now in a feminine, neutral tan color, Depend incontinence underwear for women are latex-free, lotion-free and fragrance-free.